Synopsis: This is an anime about a video game about TV mysteries. 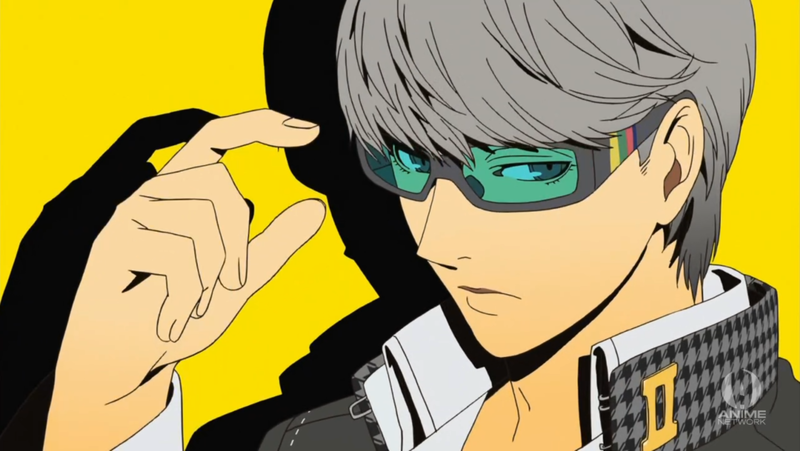 Yu Narukami has to live with his “sister’s younger brother” for some reason. Then he learns that their’s this weird Midnight Channel that only shows up during rainy days, and whoever’s on it dies the a few day later. He also discovers that he can go inside the TV. So he does what any new kid living in a strange town with magic TV murders does, he forms his own gang, talking bear and all, and goes around town solving mysteries. Pros: This was a very good show, which was surprising given that it was based on a video game. 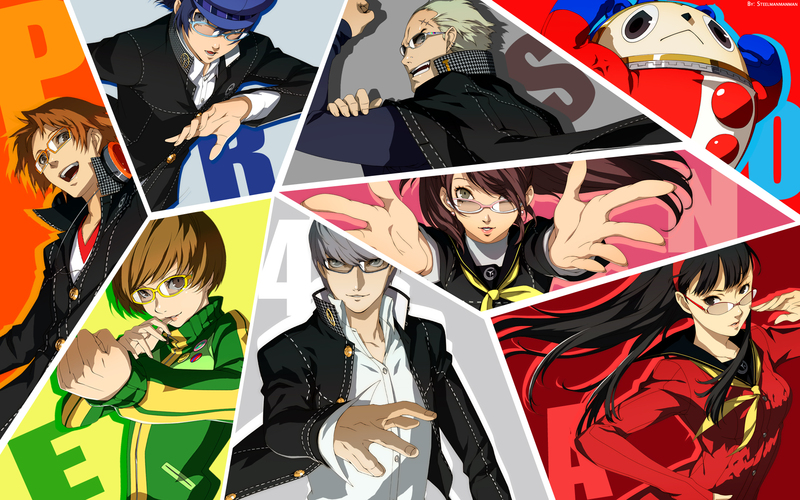 Nothing against Persona, but fiction based on games usually don’t translate well. 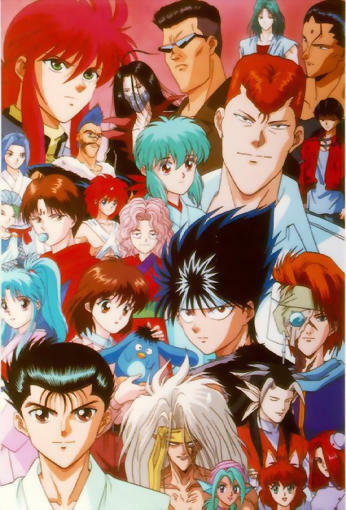 The plot and characters where all engaging despite having a cast of eight main characters and six supporting characters. The main characters has a real Scooby Squad feel to them. Even the filler episodes where just as fun, and perhaps more entertaining, than the main story. The animation was fantastic, with each entry into the TV shadow world feeling surreal but strangely familiar. An dark, inverted version of our own world. The show does a really good job balancing a myriad of elements in a 25 episode time span. Cons: The biggest problem with this show is that it’s main story is repetitive. The main story has to do with solving the town’s sudden rash of mysterious murders. So what happens is, a character is introduced, they show up on the Midnight Channel, the gang goes into the channel, they fight the victim’s shadow self, he/she comes to terms with their inner demons, and the gang gains a member. This happens eight times, in practically the same way. Luckily, their are fillers in between that let you get to know the new member on a personal basis. The last episode also pulls the “secret boss” thing that a lot of JRPG’s have, and the whole thing becomes way too philosophical. But in it’s defense, the big reveal before that was well done and a bit surprising. 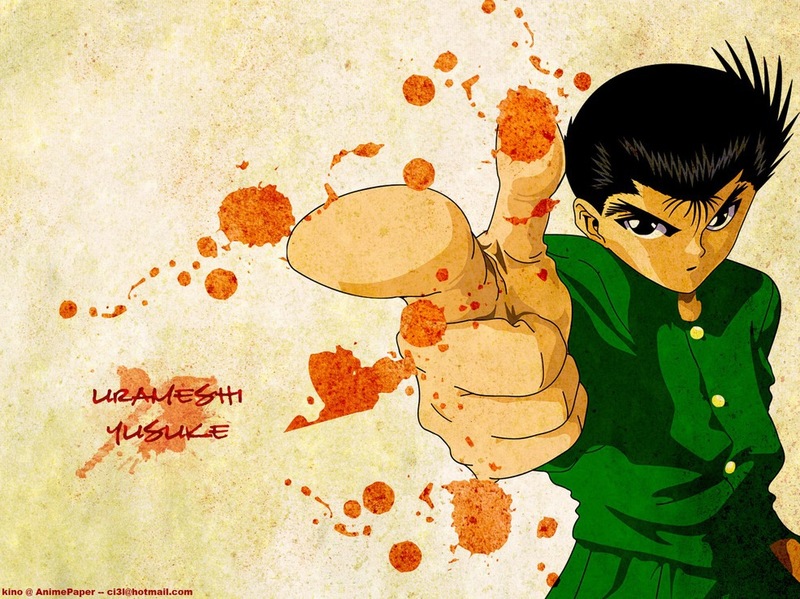 Synopsis: Yusuke Urameshi is the local youth failure when he dies after saving a kid from being run over. Heaven, totally surprised by the one time in his life where Yusuke wasn’t a colossal loser, find out that he wasn’t scheduled to die yet. They give him another chance, send him a pretty grim reaper, and eventually hire him as a Spirit Detective. Of course, by Spirit Detective, I really mean private assassin. Pros: Urameshi’s journey was very entertaining to watch. You really buy into the fact that he hasn’t had the easiest life, making him understandably emotionally distant. He plays the tough guy, but he actually cares deeply for his friends and allies. The show also did an interesting thing with the last three main antagonist, making each represent a different path Yosuke might travel down. His fighting style is also pretty cool. In fact, all the fighting scenes are pretty cool, especially during the Dark Tournament Arc. Urameshi and the demon Hiei definitely had the best fights. Cons: The title of the show might confuse you. Despite being a “Spirit Detective,” Yusuke doesn’t really investigate a whole lot. He does, like, three actual cases, and the rest of the series is just fighting tournaments. So don’t look for anything impressive in terms of plot. Don’t get me wrong, the fights are fun, but some of the opponent’s power’s are random. The series never really explains how “Demon World” works, or why some demons look like monster, while others look like humans. Well, they do explain about the Three Emperors who rule the worlds, but that’s wasn’t enough. The show also doesn’t hit it’s stride until the Dark Tournament Arc, and loses it’s fuel during the Demon World Tournament Arc. Synopsis: Renton and Eureka are two kids raised together in a secret lab. Their peace is broken when soldiers kidnap Eureka and cause Renton to piss himself. Shamed by the weakness of his bodily fluids, Renton joins the army to make a man out of himself. Then he finds Eureka and runs away. He joins up with Gecko State, a group of terrorists who are actually terrorists in this universe. Did I mention that this was a parallel universe to the original Eureka Seven? Because it is. Eureka talks more and everything. Pros: It was nice to see the Eureka Seven crew back together again. Renton, Eureka, Gecko State, their all here. This being a rehash and all, the plot was obviously sped up. What the original series covered in 50 episodes, this movie covers in 90 minutes. A lot more focus is put on Renton and Eureka as a couple. I particularly liked Eureka more this time around. This version of Eureka had more personality than the original, which was nice. 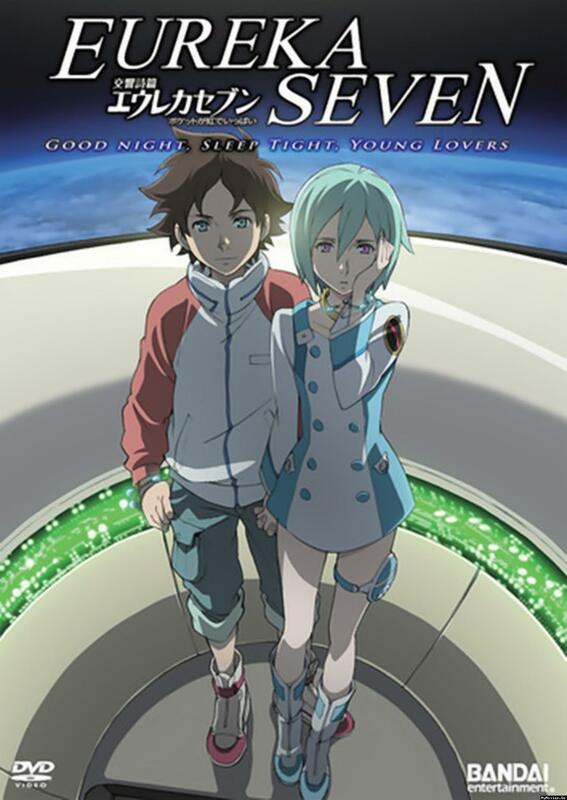 Cons: The problem with the movie was that you really needed to know what happened in Eureka Seven to like it. It kinda had an extension pack feel to it. Viewers unfamiliar with the cannon might feel that the movie’s plot is rushed. Gecko State was also kinda weird in this. They act a lot more whiny, especially Holland. Eureka Seven always had purposely awkward moments, I don’t think Holland’s dialogue was supposed to be one of them. What it? : You know what? Nah. Some of the Eureka-Renton moments were nice, but that’s not enough. Synopsis: That kooky half-vampire is at it again! Having personally solved the problems of five smokin’ hot babes, brosky tries to enjoy the remainder of his summer break by catching up on some studying and just hangin’ out. Then the universe remembers that he has two sister. One’s a karate master with a power level of over 9000, and the other wears a kimono. And do they have problems. Scary problems. 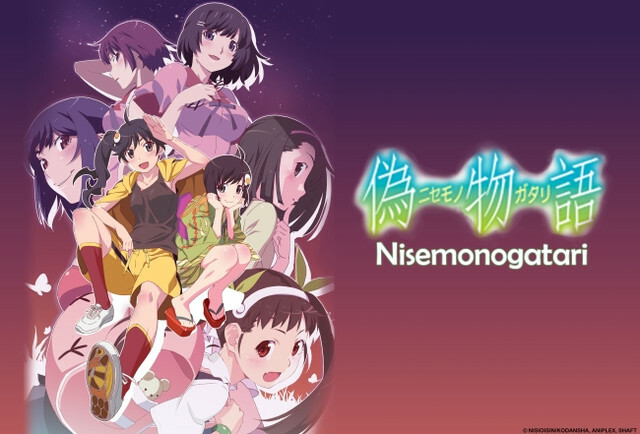 Pros: Everything you know and love about the original Bakemonogatari is all here. Its stylized animation, its master cinematography, its clever humor. The show runners even decided to amp up the fan service. What’s changed is the focus of the show. In the first season, the series was about Koyomi helping different individuals with supernatural curses. This season, however, revolves around his sisters. 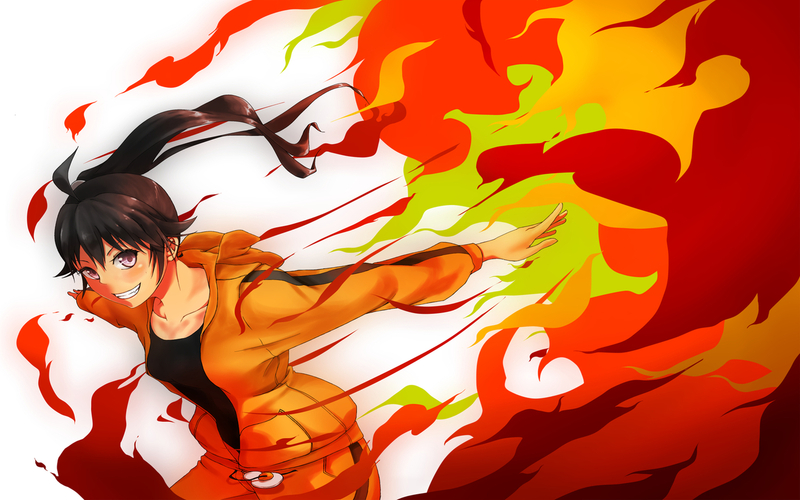 Roughly two-thirds deals with his sister Karen, and the rest with his sister Tsukihi. We’re also properly introduced to Shinobu, the vampire living within Koyomi who we only got brief glimpses of in the first season. Cons: This is very much a sequel-season. By that, I mean that viewers need to have a healthy understanding of all the show’s continuity. Who every character is, what their deal is, why certain actions are important. Characters from the first season do play less of an important role this time around. They show up just long enough to maybe frustrate fans, while definitely confusing newbies. Some may also miss the varied ghost story format of season one, though the Fire Sister stories do hold their own.